In the summer of this year I made a Proustian pilgrimage to Amiens and Paris. As I discussed in a previous post (click here), when he was about 25, Marcel Proust fell in love with the works of John Ruskin, and by 1896 he had read everything of Ruskin’s that had been translated into French. Then, as Diane Leonard (2001) recounts, in 1900, after Ruskin had died in January of that year, Proust published essays suggesting that people make pilgrimages to buildings and cities that Ruskin had visited because, although his body had died, his soul lived on in the places he had loved. Proust made his Ruskinian pilgrimage to the cathedral of Amiens in 1901. He said he went not so much to see the cathedral as to get closer to the mind of Ruskin. In my pilgrimage to Amiens, my aim was get closer to the mind of Proust. So deep was Proust’s attachment to Ruskin that he translated Ruskin’s The bible of Amiens and Sesame and lilies, from English into French, and read most of Ruskin’s other works in English, even though he said his English wasn’t very good. Ruskin called Amiens Cathedral a bible. The main parts of the cathedral were constructed between about 1220 and 1270, when only clerics and scholars could read; it therefore presented biblical themes translated into the art of sculpture, that everyone could see. Proust realized, with the experience of working on Ruskin’s writings, that his task in À la recherche du temps perdu, would also be that of translation. But in a time when most people could read, it would be to translate what is within each of us into a form of art that not of sculptures but of paragraphs. In The bible of Amiens, Ruskin lavished praise not only on the cathedral building but on its beautiful carvings, outside and inside, each one worked with wonderful skill by its sculptor, each one full of meaning. 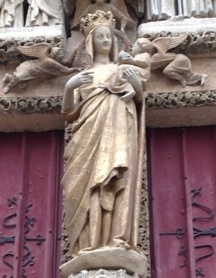 Here is a sample of what he says about the sculpture called the Vierge Dorée (the Golden Virgin), which stands above the south door, in which the Virgin smiles as she holds her child in her left arm. I have never been able to make up my mind which was really the best way of approaching the cathedral for the first time ... go straight up to the south transept ... And, coming quite up to the porch, everybody must like the pretty French Madonna in the middle of it, with her head a little aside, and her nimbus switched a little aside too, like a becoming bonnet. A Madonna in decadence she is, though, for all, or rather by reason of all, her prettiness, and her gay soubrette's smile ... (The bible of Amiens, Chapter 4, paragraphs 6 and 7). As Leonard explains, in Proust’s engagement with the Vierge Dorée, he thought about what Ruskin had written, but took the idea further. He humanized the Virgin, he individualized the person of whom the sculpture was made and he imagined the meaning of what was portrayed. He saw the Virgin as a mother, an idea that resonated with his experience his own mother, the person with whom he had the closest relationship in his life. He imagined, too, that the memory of Vierge Dorée might have come to the mind of Ruskin as he grew old and sick, and wondered whether the image in Ruskin’s memory might have included the thought of being nursed by her in his last illness. In her essay, which starts with explication of art and becomes art itself, Diane Leonard writes: “Just as the soul of the medieval sculptor, incarnated in the little figure is lost until the figure is recognized and brought to life in someone’s consciousness” so in À la recherche du temps perdu, “the soul of the Narrator is lost to him until he finds the object in which it is incarnated and identifies it, raising it from the dead and bringing it back to life in his memory” (pp. 54). Thus does the resurrection of Combray, and of Marcel’s childhood, in the novel, come to his consciousness, prompted by tasting herb tea and a Madeleine cake as he sat with his mother. Proust wrote a novel that isn’t based on a conventional narrative with beginning, middle, and end. Leonard points out that it is structured, instead, like a cathedral that one can walk round. In this way, one can look first here, then there. As one reads one can experience a profound sense of this, even though one might not be quite able to see the point of that. Could the carefully structured story in eight scenes of haut-relief of the life of John the Baptist in the cathedral’s stoa-like north side-aisle have suggested a structural basis for the sequence of scenes in the self-contained novella-story (within the novel) of M Swann falling obsessively in love with Odette, and marrying her only when he no longer loves her? Could the last judgement, over the cathedral’s west door, include the aristocrats (celebrities as they might now be called) who were once admired but who are seen now as empty and self-involved, as they shuffle off towards the jaws of hell? What better model for the novel’s structure than a cathedral, the cathedral beloved by Ruskin? After Amiens, I went to stay at a hotel in Paris into which I had booked because it was in the building in which Proust lived for the last three years of his life. When Proust’s mother died in 1905, an event that devastated him, he moved from what had been the family apartment into an apartment at 102 boulevard Haussmann, where he lived until October 1919 when his aunt, who owned the building, sold it (click here). Proust no longer had much money, and he moved to 44 rue Hamelin, in the XVIth Arrondissement. He lived there until he died in November 1922. Proust’s apartment was on the fifth floor. He called the place an “ignoble taudis où tient tout juste mon grabat” (a wretched slum, but somewhere to put my mattress). My room in the hotel was on the floor where Proust had put his mattress. In a childish way I hoped, somehow, to soak up some of his influence. Apart from people loudly opening and shutting doors at eleven o’clock at night, when I was trying to fall asleep, which contributed a sense of Proustian sleep disorder, a Proustian influence was difficult for me to detect. Now I realize why my stay in the physical space of Proust’s apartment was disappointing. When Proust recommended Ruskinian pilgrimages it was to places Ruskin had loved, where one could enter into something of his soul. The building at 44 rue Hamelin wasn’t a place that Proust loved. Apart from two plaques on the wall of the building, there is no longer anything of him there. Image: My inexpert snapshot of the Vierge Dorée. Leonard, D. (2001). Ruskin and the cathedral of lost souls. In R. Bales (Ed. ), The Cambridge Companion to Proust (pp. 42-57). Cambridge: Cambridge University Press. Proust, M. (1913-1927). À la recherche du temps perdu (In search of lost time). London: Penguin (Current edition 2003).